Forces loyal to Libyan military strongman Khalifa Haftar are preparing to advance on the country's west, including the capital Tripoli, a spokesman said Wednesday. Dozens of militias have fought for control of the North African country since a NATO-backed uprising toppled long-time ruler Moamer Kadhafi in 2011. But Haftar's self-proclaimed Libyan National Army has emerged as a key player, opposing a United Nations-backed unity government in Tripoli and backing a parallel administration in the east. 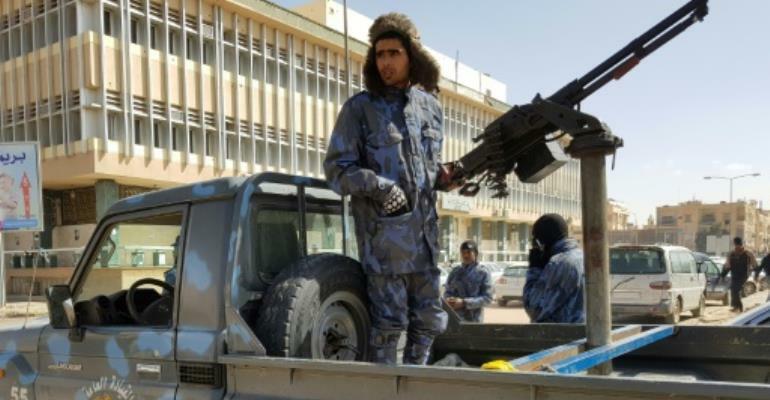 He launched an offensive into oil-rich southern Libya in January ostensibly aimed at wiping out "terrorists" and criminal groups. Haftar has repeatedly expressed his intention to march on Tripoli. LNA spokesman Ahmed Mesmari said at a press conference Wednesday that "preparations are on the point of being completed... to purge the west of terrorists and mercenaries". The force's press office said on Facebook earlier that "several units had headed "to the western region to cleanse it of the remaining terrorist groups". An accompanying video showed a column of dozens of armed vehicles moving along a road, but it was not immediately possible to identify their location or destination. Haftar's advance into southern Libya has been helped by some local support. His forces have been able take certain locations, notably the southern city of Sebha and a key oil field, without a fight. But analysts say the LNA will face a much tougher challenge in the west, where groups such as the powerful Misrata militias bitterly oppose him. Wednesday's announcement comes ahead of a UN-backed conference in mid-April aimed at laying out a roadmap to stabilise the country.